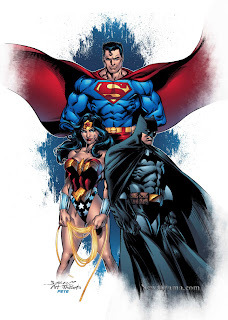 This weekend at DC's RRP meeting, it was officially announced that DC’s third weekly series, Trinity, will begin in June. The book's lead story, starring Superman, Batman and Wonder Woman will be written by Kurt Busiek, with art by Mark Bagley. "The series will follow Countdown, but, as with Countdown and 52 which came before it, will be unrelated to the previous weekly series. That said, Trinity will be “apart,” that is, occurring in the DC Universe, but not tied to other events happening in the DCU." You can catch DC Universe #0 (the bridge between Countdown to Final Crisis #1 & Final Crisis #1) which will sell for 50 cents (!) should be on sale at the end of April. Also,two new, 6 issue miniseries: Rann/Thanagar: Holy War (starting in May) and Reign in Hell, starting in June.